Published in Rafu Shimpo, May 1, 1970, Japanese section. 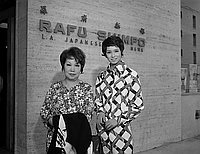 Japanese singer Noriko Awaya stands beside actress Nana Ozaki in front of the Rafu Shimpo office building in Little Tokyo, Los Angeles, California, May 2, 1970. Wearing a floral dress, Awaya has short hair and carries a jacket over her proper left arm. Ozaki, right, is a a tall thin younger woman wearing diagonal cross patterned jumpsuit. 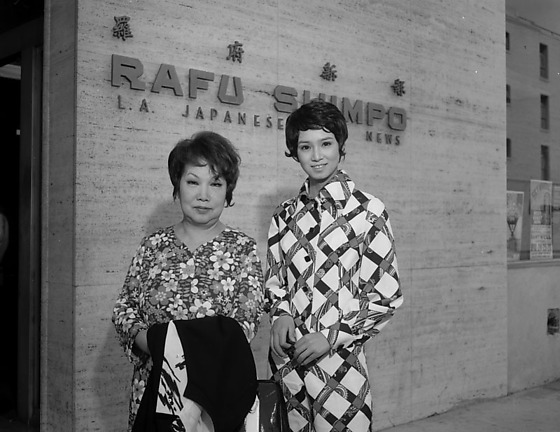 "Rafu Shimpo, L.A. Japanese Daily News" on wall behind them. Typed on original envelope: Awaya, Noriko at Rafu Shimpo. Noriko Awaya and Nana Ozaki were in Los Angeles at the invitation of Kabukiza to celebrate Shochiko 75 anniversary.